We visited Sky Zone Indoor Trampoline Park at Macgregor on Saturday the 24th of November 2018. We took Ms 7, Mr 9 and Mr 11 with us to test the venue and see if it could cater for the vast age ranges and to see how ‘family friendly’ it was. Here is what we saw/did and thought! We spent two hours at Sky Zone and were there without crowds for the first hour, and with crowds for the second hour. The impressive purpose built building is easy to find and has plenty of parking. They run 1 hour sessions (see pricing details below) and give out wrist bands so they can keep track of which session you have paid for. At Sky Zone you can jump, rock climb and play laser tag. The building is huge with great facilities and well equipped for the purpose of bouncing, laser tag, and rock climbing. There is a lovely café where you can sit and enjoy fried foods or wraps and salads. This is important because you are not allowed to bring external food into Sky Zone. They have Sky Zone reusable coffee cups which you can purchase for $16, which gives you a free first cup of coffee. For every additional coffee you then get in you reusable cup, you get $1 off the price. See below for the layout and different ‘areas’ they have for play. Sky Zone website suggests that the venue is suitable for ages 3+. Ms 7 was enthralled with it and absolutely loved every part of it. Due to the noise, I would be very reluctant to take noise sensitive children here or very small babies. There is a baby change table in the disabled toilet. There is no designated breastfeeding area, however the venue is breastfeeding friendly and staff advised they would make a private space available for any mother who requested one. They are able to heat baby’s bottles on request if you ask their friendly staff members. They do not have a designated parent’s room. Although I did not see any secure play area for very small children who were not actively engaged with bouncing, they have told us that they open up special areas for smaller jumpers. Their specially trained Sky Guards carefully supervise all jumping activity to ensure it’s safe and jumpers of all sizes can have fun whilst remaining safe. 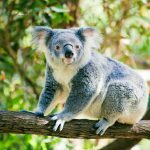 What I REALLY like the sound of is their “Little Leapers” sessions from 10am – 1pm Monday to Friday, 9am – 10am Saturday, Sundays, and public holidays. These cost is $10 per hour for 5 year olds and under and their accompanying parents. Sounds like great fun for the little ones. When I went to review today, I genuinely expected to be the one behind the camera and with the notebook…. however, I couldn’t resist a bounce… and OH MY GOODNESS it was fun!! I totally loved the foam pit, it is a full cardio workout bouncing into there and then trying to climb out!! I also asked about how they clean the foam, and they advised that they regularly take the foam completely out of the pit, clean it, remove any damaged or yucky bits of foam, and add in new foam. Sky Zone in MacGregor isn’t just an ordinary indoor trampoline park. Sky Zone connects hundreds of trampolines together for an endless amount of fun! Your kids can finally (safely) be truly bouncing off the walls. Sky Zone MacGregor is also home to the very first SkyLand – A massive laser tag arena that spans 3 stories and holds up to 20 players at any one time. This area of Sky Zone is for beginners – where you learn the ropes. Jump from trampoline to trampoline and get used to the feeling of soaring. Purpose built dodgeball courts which integrate trampolines for an intense game of ducking, throwing and dodging. Specifically-designed dodgeball courts, your playing fields for intense ducking and dodging competition. One of Sky Zone’s most popular areas, these team zones are waiting for you to unleash your inner-athlete. Our kids all loved the dodgeball zone. A huge pit of foam cubes to cushion your landing. Here you can go crazy and take a leap of faith (safely) into a big pit of soft foam cubes. The Pit is lots of fun, and lots of effort! Getting yourself out of the Pit is a struggle in itself! They weren’t kidding about thrill seeking! This attraction will leave you breathless. The Wall in question is three extra bouncey trampolines surrounded on two edges by walls. These walls can be used to kick off, run up and down, jump off and is quite dangerous. The Wall is not recommended for the little kiddies, unless they truly have proven ability in trampoline-ing! The Sky Slam Area is an awesome set up created so everyone can experience the thrill of slamming a ball through a net. $16 for 1 hour – Save $2 if you bring your own Sky Zone grip socks from a previous visit! Sky Zone’s Laser tag arena called “SkyLand” is fantastic! Three (literal) levels of fun await you in this mock Willy Wonka’s Chocolate Factory crossover with Alice in Wonderland. Three stories of obstacles and fun make this laser tag arena incredibly fun. Bring up to 20 players into this cloud filled wonderland. With the purchase of a kids party, you’ll receive the following benefits. 30 mins in a private decorated party room. | These rooms are cutely named after a type of cloud, for example; Nimbus, Stratus. It’s Sky Zone’s newest sky high pursuit. Clip on your safety harness, start climbing and scale the skies. Whether you’re on your own or with a crew, you don’t need anyone to catch you on the way down – our auto-belay braking system takes care of you. 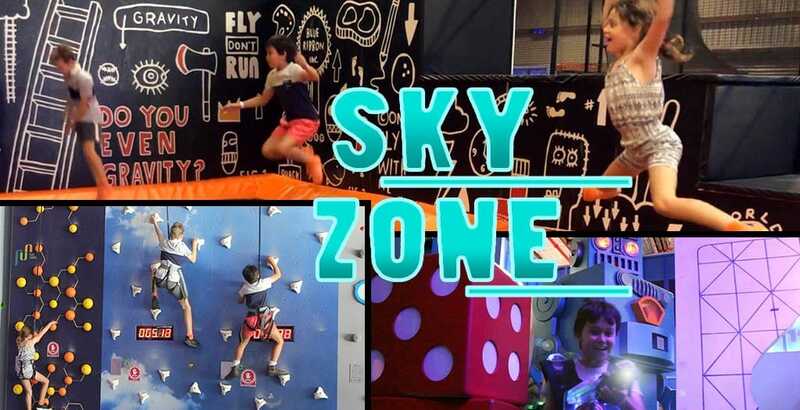 Sky Zone brings you the funnest indoor climbing for you to scale the skies. Clamber your way through a variety of walls and obstacles and challenge your friends to come out on top. Ms 7, Mr 9 and Mr 11 absolutely LOVED the rock climbing. There are different walls that the kids can climb, and challenging steps that go up and up, and a replica beanstalk from Jack and the Beanstalk. There are many different climbs to do so even with a decent number of kids in this area, everyone can still find something to climb on. Always wanted to learn the tricks of the trampolining trade? Running throughout the school term, Sky School classes follow a structured yet ever evolving program that will be tailored to the progression and skill level of attendees as each week passes. They will get a program created by Olympic medallist, Ji Wallace and learn the tricks of the trade from our trainers. Each class starts with a warm up game, then the jumpers move into the learning phase of the session and always will finish with a strength or stretch exercise. Sky School has group sizes of 6-10 people per session. $250 per person, per term. Dates largely align with school terms. This one is strictly for the over 18s. 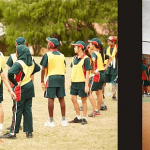 Dodgeball Leagues – on four private dodgeball courts. You can let it rip and go for glory in this 5 week competition. The winning team of the Sky Zone Dodgeball League wins a $500 cash prize! The registrations for the 2018 season have now closed. But don’t worry, the next dodgeball season kicks off in April 2019. For more information, call 13 SKYZ, 13 75 99 or email [email protected].